Cynthia Hall’s Nuclear Warning – Is It Worse Than It Seems? We have been hearing a lot lately about RAW’s intentions against Pakistan and their fury over CPEC which has been termed as a ‘game changer’ for the region. Supposedly, there are 35,000 RAW agents on the loose in Pakistan, though our intelligence agencies have not been able to arrest a single one. We have been told that RAW is responsible for terrorism, though the actual terrorists who have been arrested in connection continue to be either run-of-the-mill extremists or educated middle-class jihadis. Each time, though, the stakes keep getting made higher. Now, the stakes have been taken to a truly terrifying level with claims that India is considering arming assets in Pakistan with “small nuclear devices”. However, the source of this latest claim makes it even more terrifying that it seems. This latest statement was allegedly made by a high ranking Indian intelligence officer and was reported by Cynthia Hall writing from Damascus. In case you are unfamiliar with this journalist, don’t feel too bad. She is a complete bloody mystery. Nobody has ever heard of her, and nobody can find any information about her anywhere. Despite the fact that she has never apparently written a report for any publication before, she somehow managed to travel into Syria and get an interview with high level intelligence officers who were more than happy to reveal to this strange woman some nuclear secrets and India’s strategic plans to violate international law. If you haven’t seen the article, I will post it below. The only known existence is this online picture that is shared on social media, so I can’t give you any link. As you can see, the important points are carefully highlighted in case you only have a few seconds to read before you email this to your friends and relatives giving them the dire warning. In case you can’t tell from my tone, I am mostly being sarcastic. 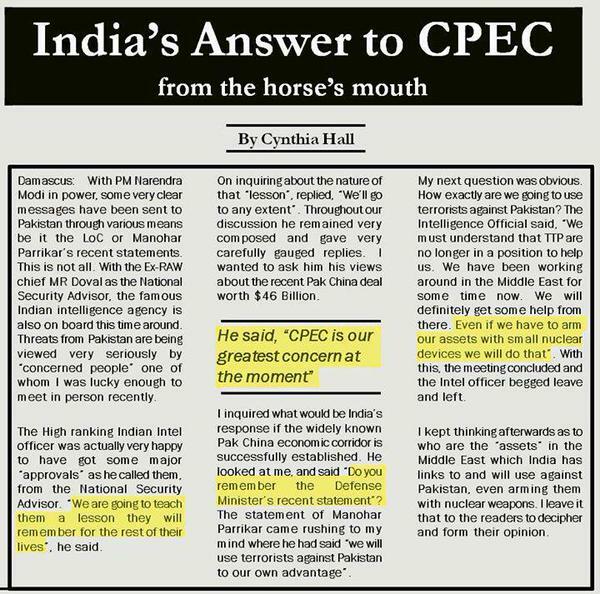 This is an obvious piece of very poorly made propaganda, and I will continue to support that position until Cynthia Hall herself comes forward and explains what she was doing in Syria and how she had such incredible access to Indian intelligence. There is one thing that I am not being sarcastic about, though, and that is that this piece of propaganda is terrifying to me. Not because I believe that India is going to give terrorists “small nuclear devices”, but because I worry about what it means when propaganda escalates into the nuclear zone. It would make no sense for India to give proxies small nuclear weapons to use against Pakistan. The first response would obviously be a nuclear retaliation, which would mean that India was acting suicidally. India’s paranoia may have brought it to a point where they are arresting small birds, but there’s no evidence that they have become crazy enough to invite a nuclear war. But that doesn’t mean that some jihadi couldn’t get his hands on a nuke, and it’s actually another recent propaganda that is what really scares me. Islamic State recently released an article by John Cantile, a real journalist who has been a hostage of the jihadi militants, that says that ISIS is working on getting a nuke from inside Pakistan. “Far-fetched” may be as good as we can hope for, but then the timing of the piece by Cynthia Hall is worrisome because it reminds me of another strange bit of information that came out earlier this year. I am referring to the statement of former DG-ISI Asad Durrani to al Jazeera that Pakistan probably harboured Osama bin Laden. Could it be that this “Cynthia Hall” report is meant to “get ahead of the story” also? Only this time it appears that there is no reporter. So whose story is it trying to get ahead of? Reading the ISIS claim of trying to get a nuke in Pakistan the first time I did not take it seriously. Of course they want you think that. Then I worried why would fake stories trying to point the finger at India for giving a nuke to terrorists be suddenly circulating just as ISIS is claiming to have a lead on a Pakistani nuke? Is it just the latest in the heated rhetoric against India coming out of the government and Army? Or is it an attempt to “manage” the perception in case something unspeakable happens? Of course, it could also be that this is just some hyper-nationalist kid’s horribly misguided attempt to put India on its back foot. If so, he should be ashamed. Whatever your feelings about India, nuclear war is nothing to joke about. Still, I pray that this is the case. This entry was posted in Blogs and tagged Asad Durrani, bin Laden, Cynthia Hall, india, ISIS, nuclear weapons, propaganda, RAW by Mahmood Adeel. Bookmark the permalink. Brilliant analysis! I concur, the article seems like a stage managed plant in a Syrian paper which is released to point a finger at India for some either lost or willingly sold tactical nukes to some jihadi or just plain crazy outfits. I can only hope your idea of a demented kid posting this turns out to be true. Otherwise this will be the end of the country of Pakistan. I hope you can take off your anti-Pakistan glasses and start giving importance to issues related to national interests.I wonder why are you so against the project which will provide jobs to millions of unemployed youth like you in Pakistan. May be you are ‘concerned’ over the fact that it is the first time Pakistan has showed the true face of RAW to the world. You might be willing to criticize Pakistani agencies but there 180 million who sleep peacefully in their homes because our agencies are working day and night to protect our country. If only you can stop beating India’s drum and consider the economic benefit which Pakistan will receive from the CPEC it will be easier for you to understand the reason why India has resorted to jingoism against Pakistan. Dude I Searched For This Cynthia Hall Nothing Came So I Am Not An Idiot ,This is a Plant By ISI. It Reeks Of ISI. Well written article. Sensible analysis . Why such articles and analysis are not presented in Pak TV channels or Pak News papers ? The analysis of Mahmood Adeel is very concerning because it has roots. Pakistan has serious problems and there is an element of desperation, specially in the military circles because of diminishing aid from US and growing ties between India and US. CPEC is a great news for the civilian government and the country and I hope that it goes through (even though I do not trust Chinese). However, it provides nothing for the military that is used to being fed regardless of the state of the nation. In fact, it puts military back to its role of defending the nation and not arming itself to wage wars. If ISIS is going to become a new source of funding for ISI and the Pakistani military, US will not hesitate for a moment to reduce Pakistan down to the stone age. They will not look at the kind of excuses that India has accepted for so long. I sincerely hope, with all due respect, that this analysis is wrong. No matter which country you belong to but going nuclear is no joke. Spreading such rumors can trigger off into something beyond control though it could give Pak a good excuse to put the blame on India. Its almost as if Pak has so many nuclear bombs and something needs to be done with them. i dont know much about this forum (a simple search about article took me here)but i think after reading this article that this forum is administered by some anti pakistani or “aman ke asha”sort of freak .he even dont know on whose behalf he is talking . Mr Usman Khan, who ever has written this article, it is a sensible one and rightly reflects the fears any person living in that area, would live under. If he distrusts the ISI, he has reason to do so. They created the many terrorist “jamats” to save them the trouble of losing wars with India and today, even they will agree that Pakistan is the biggest victim of their creations. Yet, they do not want to finish them off or to get them back into the mainstream. If these are their assets, so are the nuclear bombs. Do you think they are any safer than the terrorist jamats? And they are used to lying. Raymond Davis was released by taking money by the ISI and what were you told? Every war with India was started by the Pak military and what were you told? They lost every war. They were only prepared to claim the 1971 war and that too, because there was no way they could hide losing the largest part of Pak. The US was given permission to attack terrorist “jamats” by drone but what were you told?